The GET ACTIVE FOR LIFE mnemonic phrase summarizes the research on what helps people become and stay active, and what tends to get in the way. 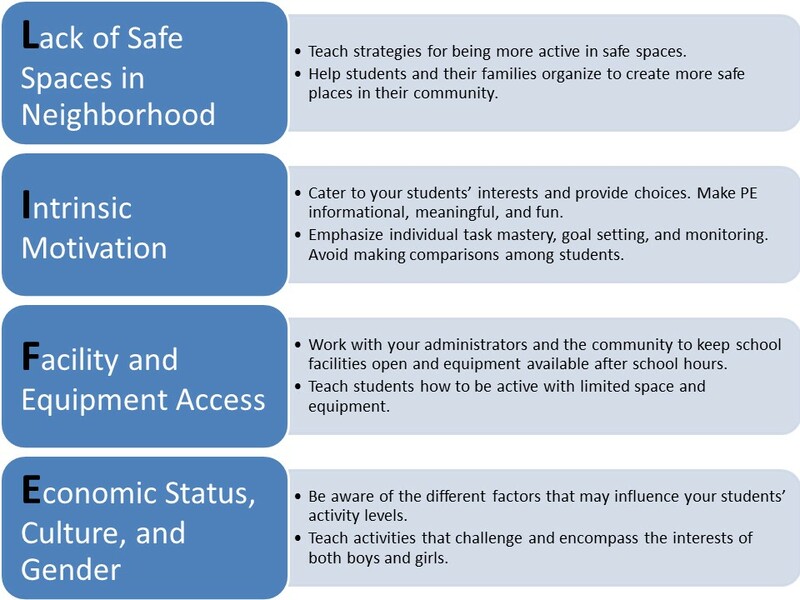 Convey this information to your students and use it to inform your curricular decisions. ​Also see this webpage from the CDC on Overcoming Barriers to Physical Activity. 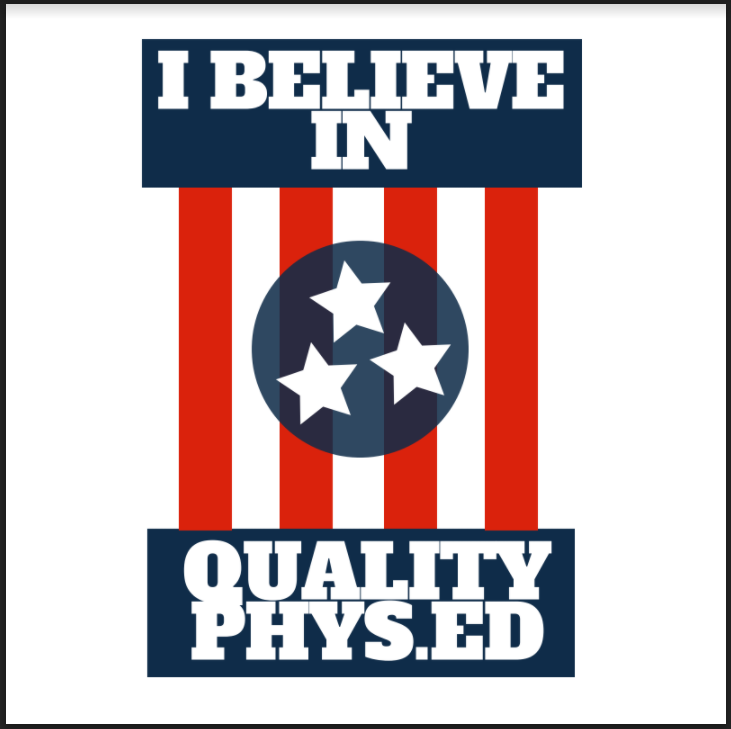 1.2.1 Teachers promote exercise for its contribution to a healthy lifestyle, encouraging students to participate in physical activity and exercise outside of the physical education setting for enjoyment, skill development and health reasons. Motivating People to be Physically Active. Marcus, B. & Forsyth, L. (2008). 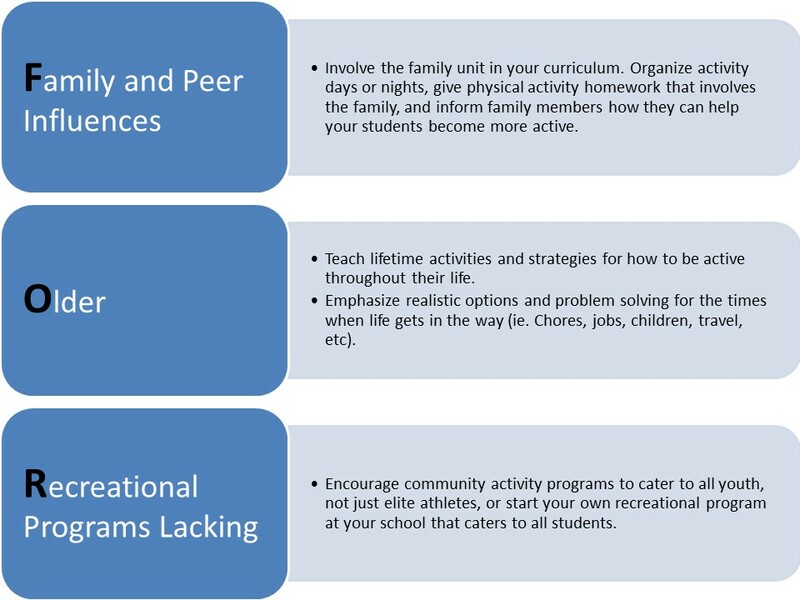 Educate students on the many health benefits of physical activity, not just weight loss and body image. 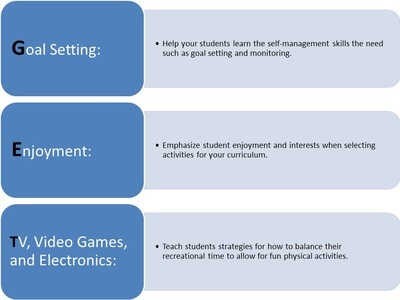 Find out what motivates your students and what they enjoy. Give students the tools to be successful and build up their confidence. Focus on the process and not the outcome or product. 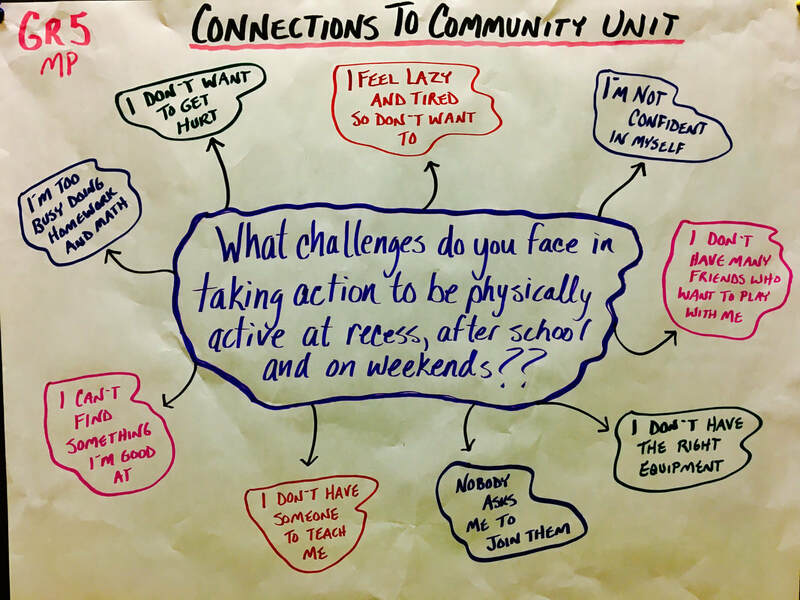 Discuss ways to overcome barriers to physical activity and relapsing. 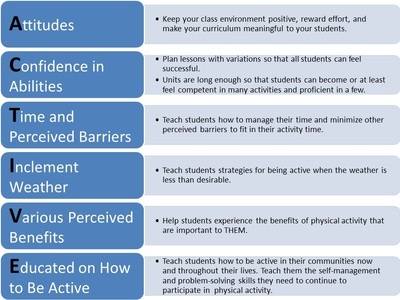 Match interventions to their stage of physical activity. 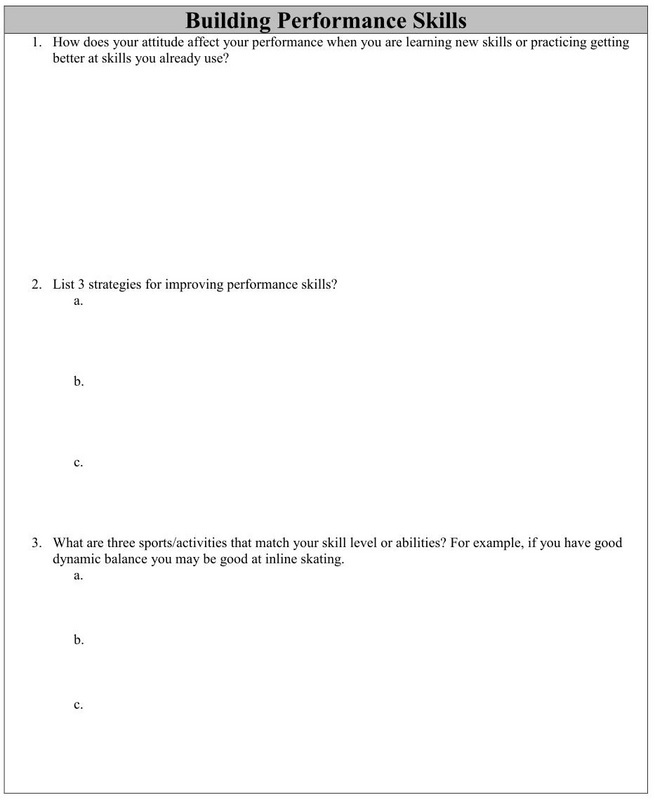 Choose enjoyable activities and individualize your program. Obtain social support; Work with a partner or group. Reward yourself for attendance, participation, & goal achievement. Find comfortable and convenient environments to be active. Utilize self management skills and basic arousal techniques. Plan for and accept minor setbacks. Develop coping strategies to deal with stressful situations. Reduce feelings of guilt whenever you are not able to meet expectations. Use positive self-talk and imagery to avoid negative thoughts about relapsing. Identify situations that put you at risk for relapse and avoid or plan for them. 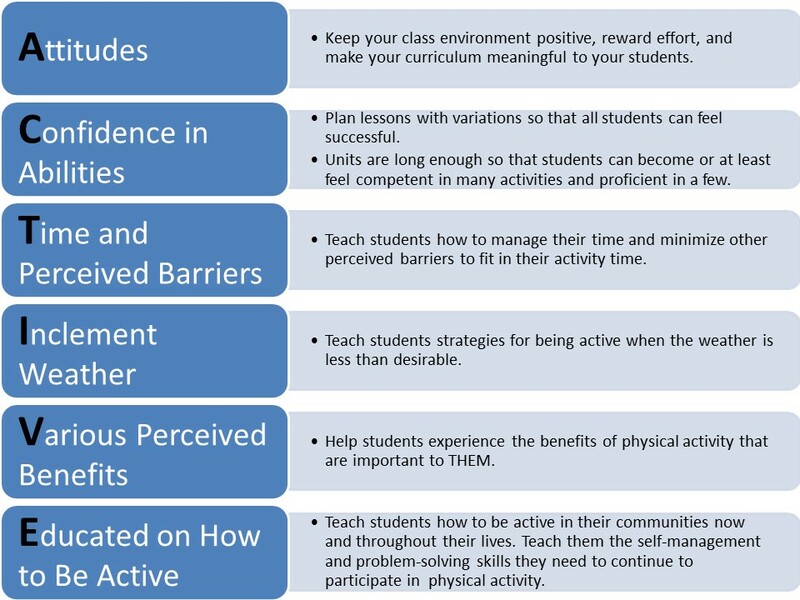 Teachers can use the strategies from the Transtheoretical Model to help their students improve or maintain their physical activity levels. First assess where the student is and then use the appropriate strategies. Use mood words and positive statements. 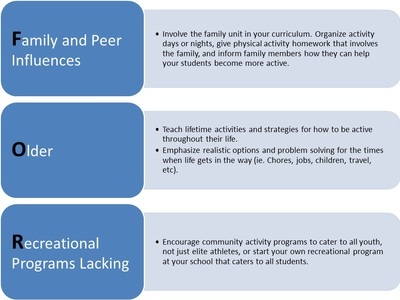 Learning self-management behaviors has been proven more effective in increasing physical activity behaviors than solely teaching students about the benefits of physical activity. The download below was created using the self-management information from Fitness for Life (Corbin, C. & Lindsey, R., 2007). 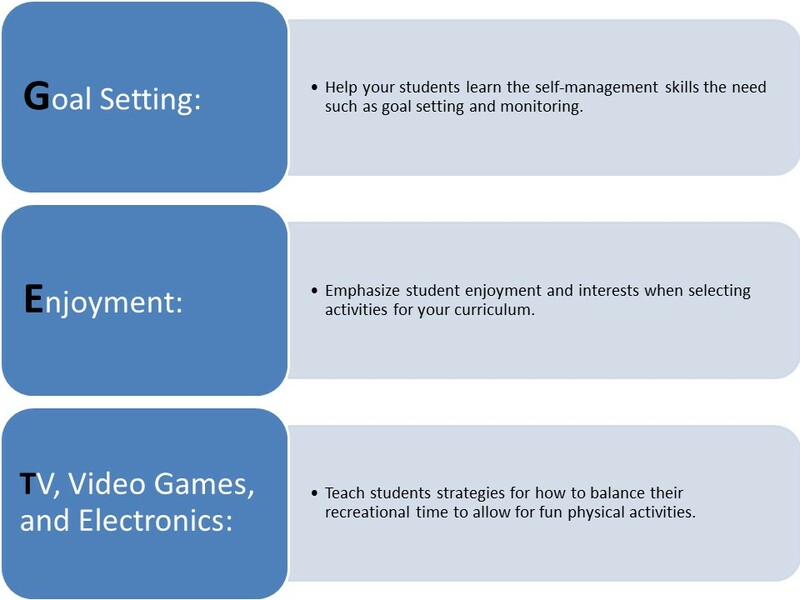 It includes student assignments that address all of the self-management skills listed below (some tasks require that you use the Fitness for Life textbook in order to complete). 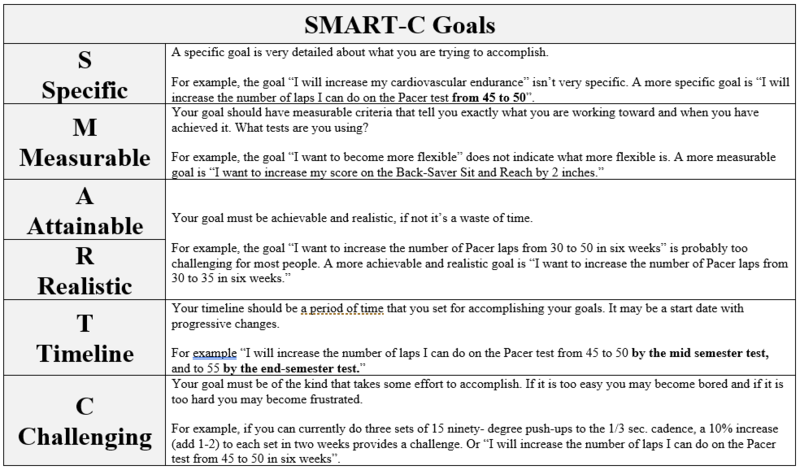 Set specific goals that are challenging, yet achievable. Write your goals and plan down. Develop strategies to meet goals. Re-evaluate goals and revise when necessary.